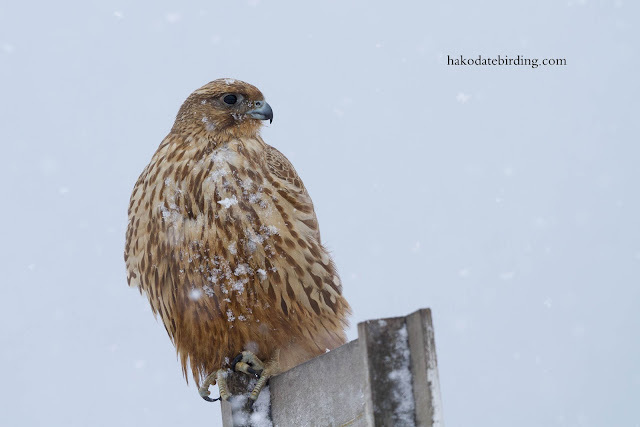 The Gyrfalcon was very tame today, just sitting around on a signpost in the snow. There were several other photographers snapping away, it only flew off when a car appeared over the dunes and pulled up unexpectedly. It was snowing heavily most of the day. It looks like the falcon may stick around, hopefully I can go on a quiet day with not so many people around and better visibility. It was not the only raptor sitting around in the snow today. 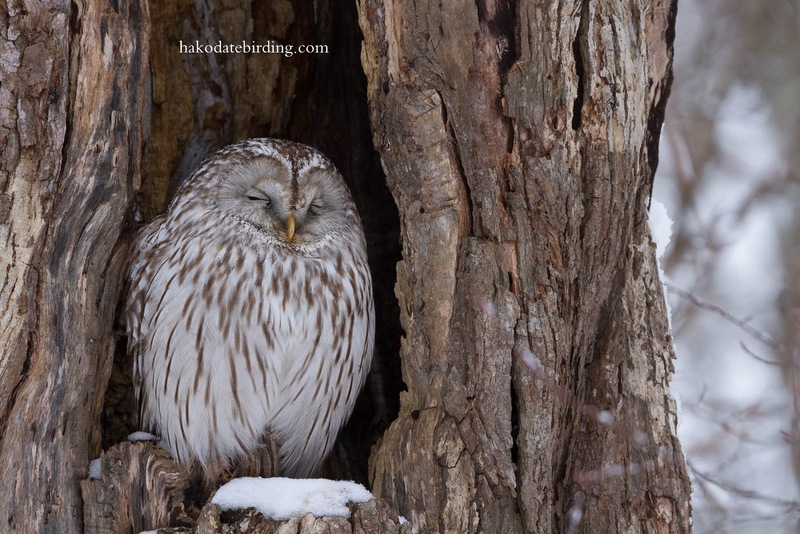 The Ural Owl at Onuma was dozing in the snow. I took a short video, the bird you can hear in the background is a Black Woodpecker. As you can see it doesn't do much. We took the coastal route to Onuma. The usual stuff was around: several White Tailed Eagles, Brent Geese, Harlequin Duck, Black Scoter, Common Buzzard, the regular wintering gulls etc. In east Hakodate there wre flocks of Crossbill and Redpoll high up in the trees. He's certainly handsome. I hope he stays around for a while too. Interesting to see the video too. I guess it will stick around most of the winter due to the abundant food supply. It is already becoming a national celebrity with photographers from other parts of Japan appearing from everywhere to photograph it. Me again..... must be asleep today. A Video clip...? You're "raising the bar" here, Stu. ! Fab shots of a bird I've yet to see in Japan or anywhere else! Jealous much!! The Ural Owl is pretty fab too! !